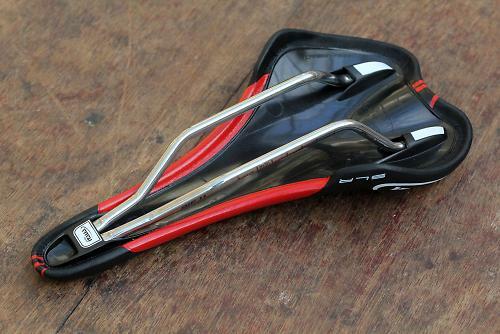 The Selle Italia SLR Team Edition saddle is the team version of their long-standing SLR model. It brings together both a lightweight construction and attractive design in an updated version. The two most obvious changes are the design and the rails. The design is considerably different, taking the simple black and white, and making it red and black. The central band down the centre of the saddle is now a intercrossing network of red lines on a gloss material, contrasting with the matte black leather around the edge. It also has red inserts along the side which match the red in the central saddle design. In addition to this redesign, the rails have also switched from carbon to titanium. This, plus some added padding that certainly helps on longer rides, has added around 30g to the overall weight of the saddle, but it stills comes in at a very reasonable 170g. It has not lost all of its carbon though and still maintains around 30% carbon throughout the saddle. The SLR Team Edition is comfortable, but with a change in the material used on the top, I did find that my riding position would slightly shift while I was riding. Although it was never a major shift and was normally forward and backwards, it was slightly off-putting when concentrating on getting the power through your legs. Aside from this (which was an occasional thing) the saddle performed well. 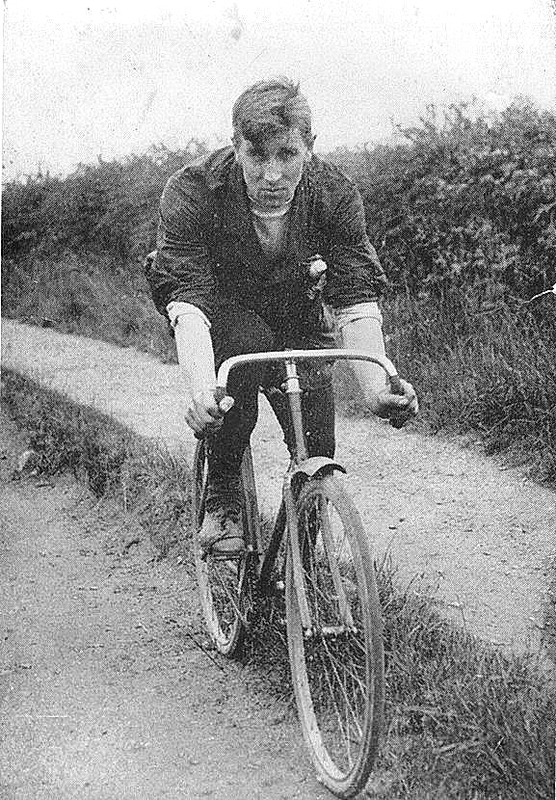 On longer rides it was comfortable and firm, allowing you to feel the road but without it shaking through your body. Much of this comes as much from the impressive flex in the saddle, as well as the additional padding that Selle Italia have added. Another aspect of the saddle that I like is the low falling sides, that sit 1-2cm lower than most others. Initially I thought that this may be an issue on longer rides as it could create some friction on the tops of my legs, however it actually did the opposite, and takes away the very rare, but very annoying catching of your leg on the edge of saddle. This can take your concentration away at key moments, often when you are pushing the hardest or need to concentrate the most. Overall, I was very impressed with the Selle Italia SLR Team Edition saddle and it will probably be the one that stays on my bike for at least the next six months. The combination of lightweight and strong design has meant that it is very comfortable to ride long distances on, but also allows for intense and performance rides. A high quality saddle designed for both amateur and professional riders that want both comfort and performance. I can safely say that it achieves both comfort and performance as the flex and additional padding have been useful on longer rides but have not effected its performance on climbs or sprints. Very well made, solid but with a slight flex that makes riding it comfortable without feeling overly padded. Strong performance from the latest edition of the SLR Team saddle. The only slight drawback is the small amount of sliding that comes from the gloss middle section, but with a bit of riding it, I am sure this would stop. With no visible stitching and a strong construction, this saddle is likely to last for a long time. I have to compare this to the older version, which is 30g lighter, but more expensive. Although it sits on par with others in this price band, it would be unfair to give this stronger marks given the weight increase from the older version. With the amount of flex and padding, it is comfortable to ride for longer periods as well as not holding you back when climbing or sprinting. This sits mid range in terms of saddles, whilst not having the same weight savings as a saddle with additional carbon components, it has a good bang for your buck. Great for both long or short fast riding, a good all rounder. The flex in the saddle without feeling that it has somehow compromised the structural integrity of the saddle overall. Although the lower sides do have their benefits, they do sometimes get annoying when using the saddle for a long time. That said, it is not something that would put me off the saddle in the long term. A hundred and fifteen British pounds to park one's posterior ? They are surely extracting a urine sample. I picked up the Selle Italia SLR Kit Carbonio Flow Saddle 125gm for 98 quid, before christmas. originally was £150+ but i got it in one of planet x's sales for £50! Picked up a monolink version for £40 last year but not as comfy as my Arione . The standard version is £77.00 and is basically the same saddle without grasish graphices only slightly average. Flite saddles for 20 years. It is the original light weight saddle and still the best. Well my back side thinks so.